Dr Indran Indrakrishnan presenting the service award to Dr Bipin Chudgar. 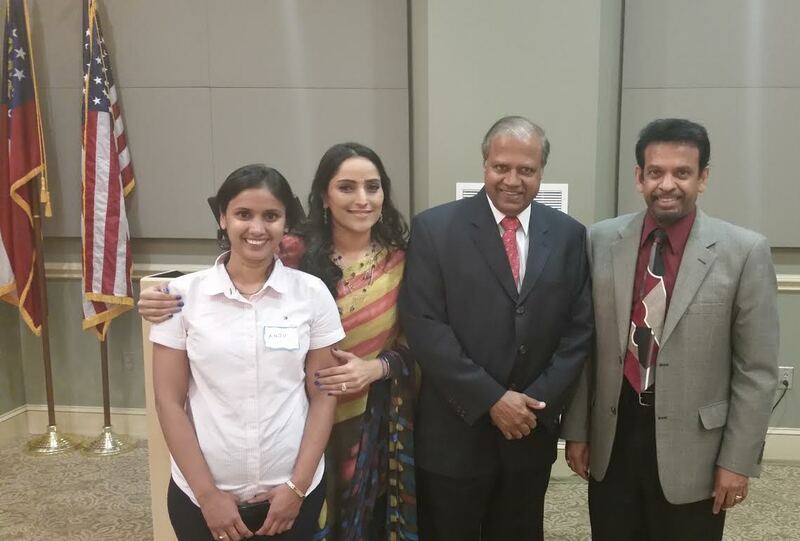 Atlanta, GA: Georgia Association of Physicians of Indian Heritage ( GAPI) Regional Meeting was held at Georgia Regents University in Augusta on August 24, 2014. The meeting was organized by GAPI past president, Dr. P.K. Natrajan, GAPI secretary, Dr. Vijay Maurya, and Dr. Tarak Patel & Dr. Hemant Yagnick from GAPI board of directors with the help from GAPI Volunteers Dr Amit Gupta, Ms Rina Gupta & Dr Anju Kandalai. 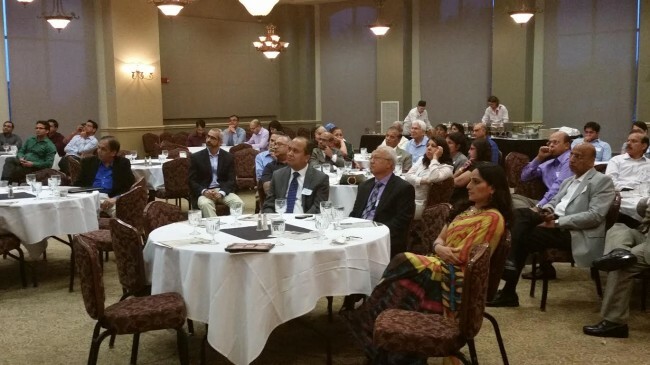 The meeting was well attended by More than 50 physicians of Indian heritage. 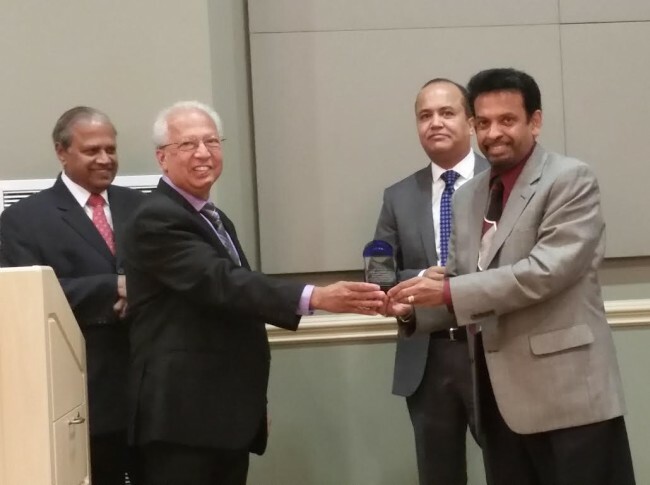 Dr Indran Indrakrishnan presenting the service award to Dr P.K. Natrajan. GAPI board meeting was held at 4.00 PM during which GAPI president Dr. Indrakrishnan updated the officers as to the past & upcoming events and other officers contributed their valuable suggestions in terms of improving the efficiency of GAPI‘s functionality . Dr. Natrajan opened the general meeting, welcoming all the attendees and their spouses and recalled the contribution by Indian physicians of Augustato the community even well before GAPI was founded 26 years ago. Dr. Indrakrishnan , GAPI president updated the attendees about successful GAPI-APPNA health fair inaugurated by Senator David Shafer with the chief guest being Governor Nathan Deal and GAPI leadership meeting with visiting Indian Health minister Hon. Harsh Vardhan in Atlanta. He announced that GAPI is a welcoming partner organization for the upcoming reception for Hon. Narendra Modi on September 28th at the Madison Square in NY and it will be well represented by its officers & senior members. He emphasized the importance of GAPI getting involved in serving main stream society beyond the Indian community. He invited the audience to attend the grand musical dance drama production, Once upon a time – Beauty & the beast on October 26th at the Gwinnett Civic center. This program is produced by Bharathakala Dance Academy & Third eye Dancers partnering with GAPI to raise funds for two charity organizations. The net collection will be exclusively donated to Tapestri and Soldiers’ Angels. Tapestri works for the benefit of abused children victimized by human trafficking inGeorgia and Soldiers’ Angels support the wounded war veterans ofGeorgia. Dr Raghu Lolabandu, GAPI treasurer explained the benefits of being a GAPI member and requested the attendees to help with the membership drive inAugusta. Dr. Hemanth Yagnick, from Board of Directors and Dr Vijaya Maura , GAPI secretary spoke of three senior physicians & past GAPI Presidents , Dr. P.K. Natrajan, Dr Bipin Chudgar and Dr Vinayak Kamath on their extensive contribution to GAPI, philanthropic activities in the community and the humanitarian services . Dr Indrakrishnan honored all three distinguished physicians with service awards in the midst of cheering loud applause from the audience. As the final item, Dr. Tarak Patel gave an outstanding educational presentation titled “Updates on Antibiotics”. It was a timely topic of interest among the audience and a lively question and answer session followed his talk. 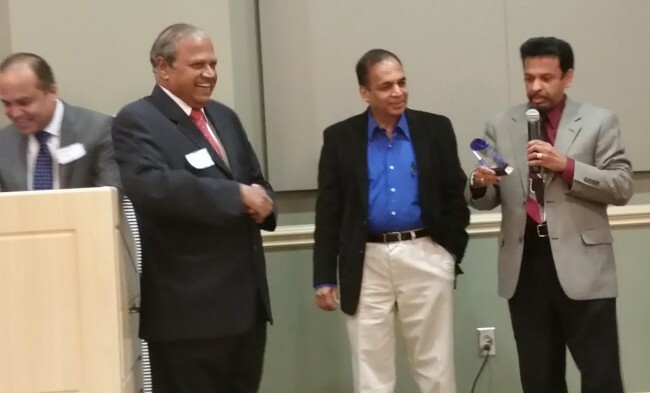 Dr. Natrajan thanked the attendees and the leadership which was followed by the Italian cuisine dinner.